Philadelphia, PA (July 29, 2010) – John Gullace has recently been appointed Chair of the Alternative Dispute Resolution (ADR) Committee of the American Bar Association Section of Environment, Energy and Resources (SEER). He served as Vice Chair for the Committee from 2008 to 2010. 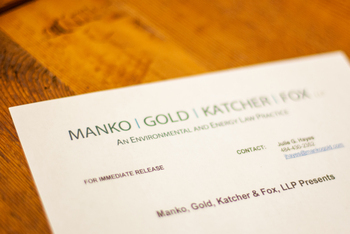 Gullace is a partner at Manko, Gold, Katcher & Fox, LLP (MGKF), the environmental, energy and land use law firm based in Bala Cynwyd, PA.
As committee Chair, Gullace will be responsible for developing a committee action plan, appointing Vice Chairs and ensuring that the committee develops programs, publications and teleconferences about ADR in the environment, energy, and resource context as well as communicating with the ABA's membership about these issues. He will also be speaking on August 6 about ADR at the 2010 ABA Annual Meeting in San Francisco as part of a program titled, "Practicing Law in a Fishbowl—the New Reality of Engaging the Public in Environmental Decision-Making." Gullace helped organize the program and SEER is a co-sponsor.